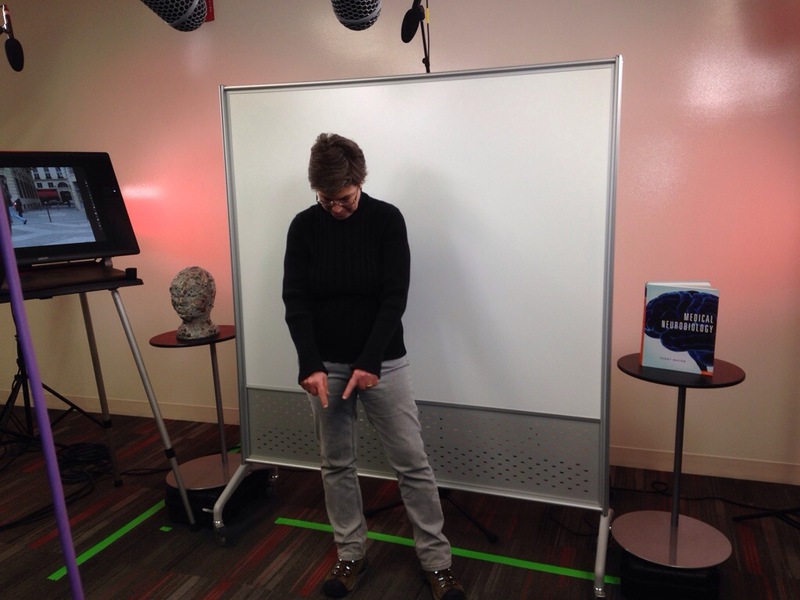 Filming a MOOC – The brain is sooooo cool! My view from where I stand at the front of the set. From left to right: Ryan McDonald, Emily Bembeneck, Marlon Aguilar. Not pictured: Andy Poulos, me. Organizing, designing and filming “my” MOOC, Understanding the Brain, has been an amazing experience. I put my in quotations because the MOOC is definitely a team effort. Not only are others entirely responsible for the technical and aesthetic aspects of production but Emily Bembeneck is a true director. She makes sure that I appropriately target my audience with engaging and understandable lectures. She dials down any tendencies that I have to get overly detailed and arcane. As I prepare my lectures on each topic, I work to identify the critical essence that lies within. I think about why my cousin or my UChicago student’s parent or my train conductor should care about the topic. What makes it important, what are its implications. How does learning about the brain help a person live a more fulfilled life? 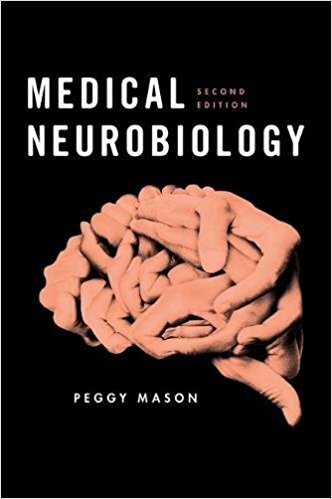 Approaching the topic from this perspective has given me new insights into the conceptual and philosophical fundamentals of neurobiology. Teaching is indeed a fabulous way to learn. In the rest of this post, I want to give you a flavor of how filming proceeds and what it entails. Every morning I go directly to our set where I meet Emily, Marlon, Ryan and Andy. We tape until a unit is complete, which takes us at least the morning and often into the early afternoon. Lectures consist of short segments, 4-10 min, ideally about 5-6 min, in length. Our filming follows the chronological order of the MOOC. In the early days of filming Understanding the Brain, the set was fairly simple. I wore a microphone and wrote on the wall (a white-board wall). The camera operators, Ryan and Andy, used green tape to mark out an area that measured about 9 x 5 feet (3 x 1.5 m), within which I was free to roam. Ah, the freedom! Memories of care-free days. 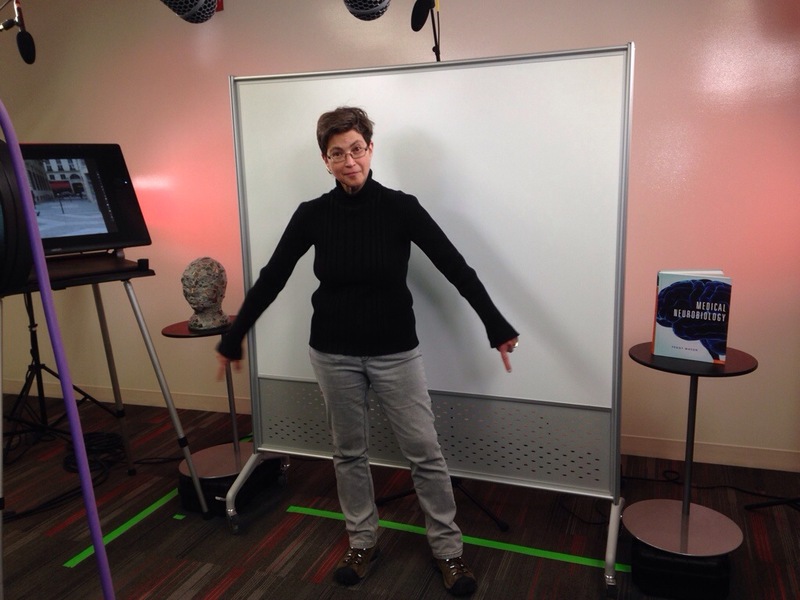 Then Emily, the MOOC producer and director all rolled into one, decided to snazz up the set. We got a stand alone board that stood about 2 feet out from the wall. A couple of tables were placed on either side of the board to hold a wonderful piece of art by my spouse, Gisele Perreault, and a copy of my textbook. Microphones soon decorated the space above me, obviating the need for me to wear one. As the air space above me started to fill up, the lights also appeared to multiply and my green-lined rectangle appeared to shrink on a daily basis. Now, the set is nicely elaborate, better looking, and more visually entertaining; and my current green rectangle is quite a bit smaller than it was originally. I accuse Ryan and Andy of progressively “gaslighting” me, shrinking my green cage imperceptibly each day, trying to convince me that I am crazy (as Claude Rains’ character did to Ingrid Bergman’s in Notorious). 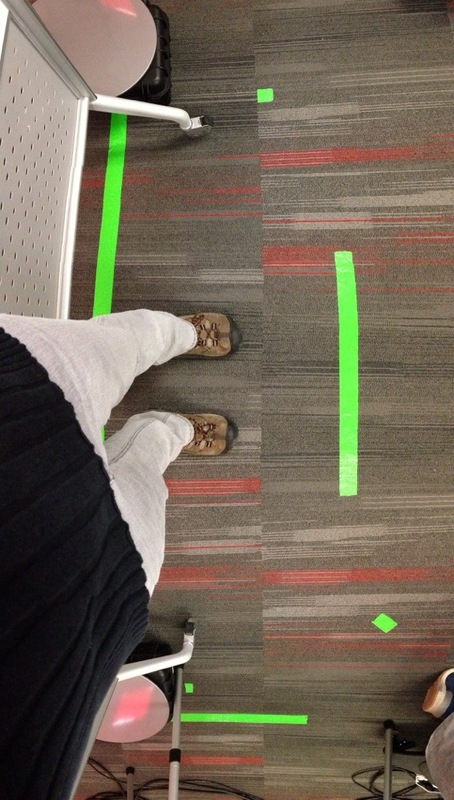 Below are some views of me inside my green area, from this morning’s taping. I had a question about the brain, and I hope you can answer it. What is the effect of sleep on the brain? I also had one more question. 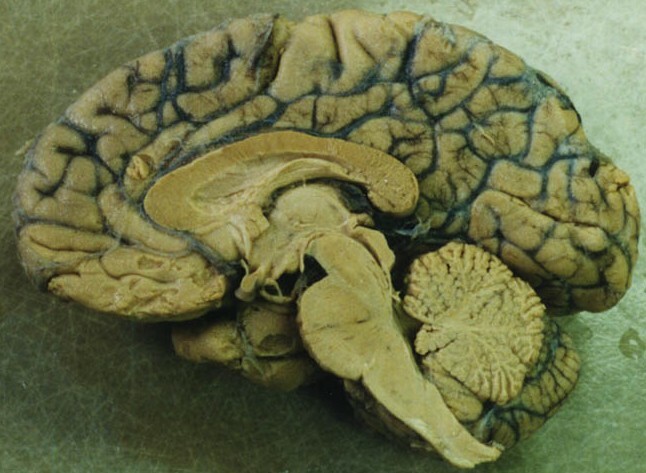 It is now known that a human can survive with half a brain, as the remaining half has the ability to develop in a certain way as to make up for the lost parts. But in doing so, doesn’t the brain also have to lose some of its own parts/functions to make up for the lost half of the brain and its functions? If so, what do we lose? 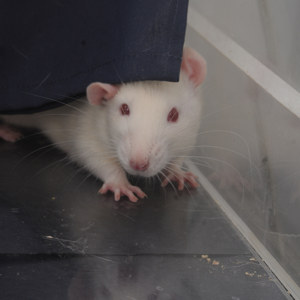 What is the extent of the brain’s regenerative abilities? Pingback: Our remarkable oculomotor system | The brain is sooooo cool! Pingback: Bragging about NeuroMOOC students | The brain is sooooo cool! Your course is amazing. I finished the unit on Strokes… I feel so frail and yet so thankful for having a fully operational brain as of now. Thanks for your teaching prof. Regards from a Colombian in the Philippines!